Arriving in Myanmar after only one hour flight, coming from high tech, fancy, chaotic Bangkok, is like traveling back in time. The first thing to notice arriving at night is the lack of light, the simplicity, an immediate “Indian”like flair with different smells….a country with lots of charm! Especially the poeple are incredibly nice, sweet and helpful in Myanmar. We as touristis felt like welcoming attractions! 1. Shewdagon Pagoda in Yangon. We spent 3 hrs admiring this 100m high golden Pagoda ( coated with 750kg of GOLD, 5000 diamonds and 2000 rubies). Breathtaking also because the pagoda was surrounded by thousands of candles, magical! 2. Teak U Bein Bridge: the longest teakwood bridge in the world. Our most beautiful sunset so far, really kitsch but sooooo romantic. A. Trekking in Hispaw where we slept in a traditional family home and visited different villagers. B. Inle Lake on a small boat where we could see the traditional fishermen, water villages and temples. 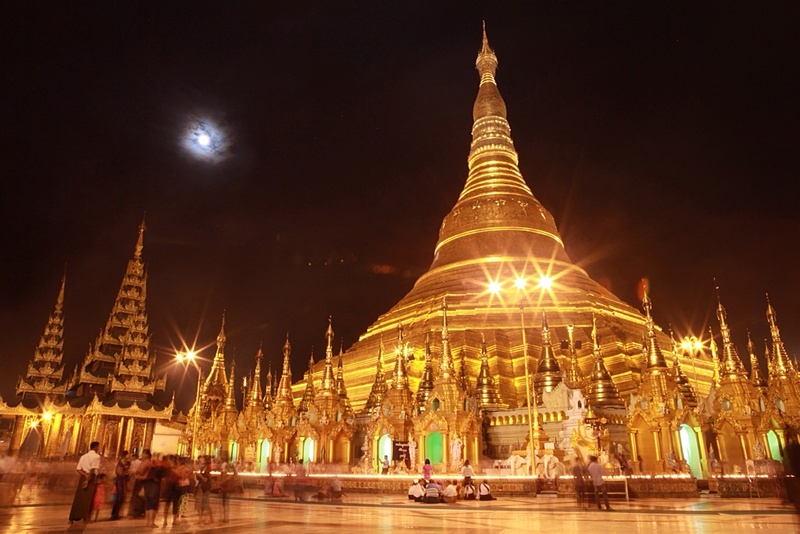 Nevertheless Myanmar is worth a visit and we are happy that it was on our travel route. Keep visiting, the updated world map with our next destination coming soon. Really great Pictures! Love them all with this beautiful sunset :)!